The USB dongle has nearly the same features like the evaluation kit but comes without the sensors. With two USB dongles and the properitary stack you can test the range easy. It you replace the ceramic chip antenna carefully to a customised antenna solution, then you will rise the range for sure. If you are not sure how to replace the antenna on the 6LoWPAN dongle, then it is save to ask your local Field Application Engineer or an engineering office with focus on wireless communication for advice. As we all know is the antenna the key to success in and wireless application. 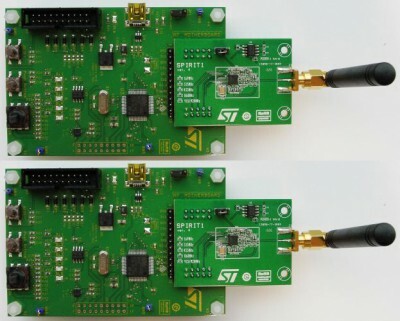 It is the same RF transceiver board like listed in the upper mentioned evaluation kit. It can be used for connecting it to an own PCB to design a small customised application quickly. The SMA plug can be removed easy to connect another smaller antenna. Remember that a piece of wire in right length is already a pretty good antenna. You also can connect a coaxial cable with striped open end in right length or you can solder a PCB antenna with coaxial cable direct to the RF transceiver board as well. This RF module will be available soon. With its small footprint of 11 mm x 16 mm including the antenna it will fit in nearly any application. Based on 6LowPAN, wireless M-BUS and two proprietary stack it will cover most of the requests in sub GHz easy.